Back in January I wrote a series of posts aimed at novice users. 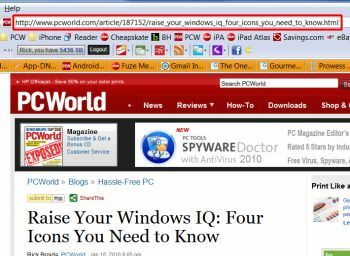 (For example: Raise Your Windows IQ: Four Icons You Need to Know.) I think it's time to revisit that series, to help novices master more of the Windows basics many of us take for granted. Today's topic: sharing. I have a family member who, bless her heart, reads a lot of what I post online and often wants to share my articles with friends (thanks, Mom!). The problem is, she's confused by the icons for things like Digg, Reddit, StumbleUpon, etc. that usually accompany such online content. What if she just wants to e-mail my lovingly crafted words to someone? So, how do you share a Web page with someone? Simple: click once in your browser's address bar to highlight the Web address (this works in both Firefox and Internet Explorer), then press Ctrl-C to copy that address to the Windows clipboard. Now create a new e-mail message in whatever program or Web service you use, then press Ctrl-V to paste the address into the body of the e-mail. Simple as that! Update: As several astute readers have pointed out, your browser makes this even easier. In Internet Explorer 8, click Page, Send Link by E-mail. In Firefox, click File, Send Link. Do you need help with a beginner-level Windows topic? Post your question here or send it to hasslefree@pcworld.com.